This weekend, I will have the privilege of blessing Vanessa and Sheryl's marriage and it's made me very aware of how things have changed for LGBTQ+ people since MCC started, 49 years ago. At least, they have changed in the UK and many other countries. It is a stark reminder of the reasons that the work of UFMCC and the Global Justice Institute is still incredibly important. I often hear comments - even from other queer people - assuming that the progress we have made in the UK and other countries means that we no longer need to be activists. We can't afford to take our rights for granted, and we have no right to claim to love our neighbour if we turn a blind eye when people beyond our line of sight are suffering. In addition to signing and sharing the petition circulated in last week's Rainbow News, you can donate to an organisation working in the region, such as Amnesty International or the Global Justice Institute. Even by continuing to support NL MCC you are helping us to regularly give to the GLobal Justice Institute, and to run Rainbow Home to support LGBTQ+ asylum seekers living in the North East. In all honesty, though I’m one for commitment on many ways, I have not been quite so eager to take responsibility. I can be flaky and flighty, and tend to talk myself down out of fear of failure shortly after making an initial decision. It’s something that's held me back for a long time. Last Sunday I came into membership – a decision a couple of years in the making, and one I’m glad I’ve made. It's an auspicious time; not only Easter but near the beginning of my first year striking out on my own, away from home. I’m in a position where I am in full control of my life for the first time. The phrase “today is the first day of the rest of your life” comes to mind, and no matter where my life takes me, I have decided that I want to make that walk with God. I already decided that a few years ago, but after prayer, I felt the need to make that commitment more tangible. I wanted to not only show my commitment to God in a public way but to take responsibility while doing so by offering to serve the church which has brought me closer to Them than ever. I will fall short. I will almost certainly be late for things, I will make mistakes, I will not always be able – or willing – to give my all, but I know that that is human, and that God will use me as I am. I have chosen to refuse to let the fear of what I cannot do keep me from doing what I can, and I will hold onto that choice and let God lead me wherever They will in the years to come. I’m deeply thankful for all of you for supporting me in getting this far. “What are 3 of your weaknesses?”. I’m always surprised when the people I am interviewing have to really think about their answers as I consider these to be standard interview questions and so would expect people to come prepared with answers. It makes me feel that they have not done their preparation and therefore if they haven’t prepared for this what else haven’t they prepared for and how serious are they about the job? One of the objectives of the Pastoral Search Committee is to do the ground work in preparing what we are looking for in a Pastor, hence the recent survey that many of you completed. As part of the review of the answers Lily did her magic with the computer and came up with a “Word Cloud”. You can see this on the right (click to enlarge). 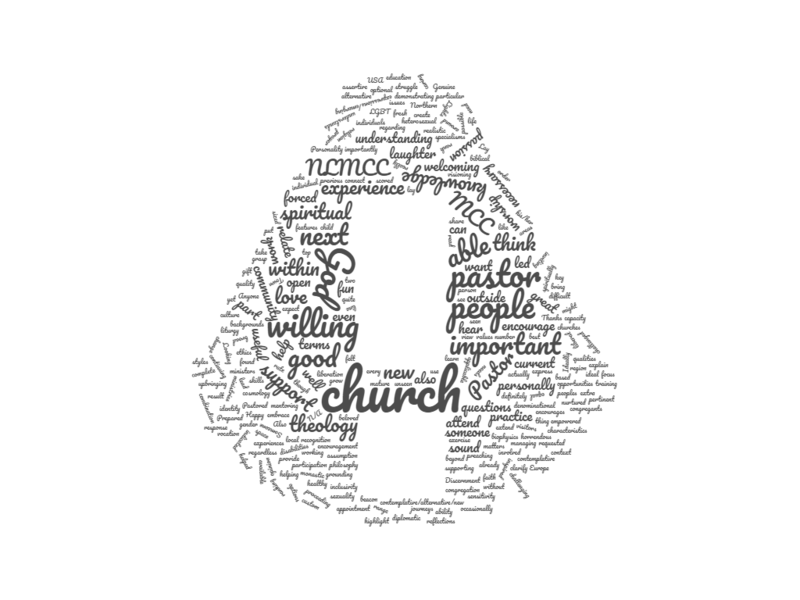 There are some great words coming out of this, one’s which show who we are as Northern Lights MCC, as well as what we want to see in our Pastor. As come to Easter Sunday and remember how we have been given new life via the death and resurrection of Jesus let’s celebrate how Northern Lights MCC can be given new life and see our weaknesses turned into strengths. It is definitely spring around our house today. The birds are out in force making a joyful noise, and Mrs. Evadne Cake (our pet cat) is sunning herself on a garden bench. It feels as if everyone is waking up. Even people around the city centre seem more cheerful and relaxed. Families are off on the Easter break, and there are three bank holiday weekends coming up in the next five weeks. It finally feels as though the long winter is behind us. At Passover, Jewish people around the world remember their liberation by God from the slavery in which they were held by the Egyptian rulers. It was this festival that Jesus was celebrating when he entered Jerusalem, and for which he held a celebratory dinner with his closest friends and disciples on the night before he was betrayed. The Eucharist seems to be based to some extent on the Seder meal at the heart of the Passover celebrarions. As we gather for the feast of our redemption, we are in solidarity with the Jewish communities celebrating Passover and we remember together that it is God who sets God's people free.